Dream's zeroDELTA .mirrors and CF & CFSC structures are enabling the future of modern ground, air and space with next generation performance. Dream designs, engineers and produces carbon fiber parts and finished assemblies, as well as bubble-free cast glass engineered lightweight precision optical mirrors. From 20mm to over 1m. The interior of our largest composite oven is 3.66m wide, 1.83m deep and 1.68m tall. 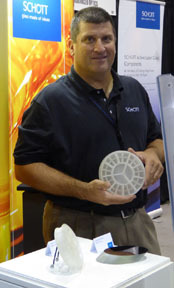 Both of Dream's core technologies are produced in-house in Nazareth, Pennsylvania (USA). ABE airport is less than 15 minutes from Dream. zeroDELTA aspheres have been finished to L/125 (5nm) RMS surface, 2Å (0.2nm) RMS surface roughness with radii as tight as 0.002% of nominal. They can be finished to a super-polish (1Å (0.1nm) or less), which is limited by the process & optical metrology, not the zeroDELTA mirror. More than 80% of the products that Dream produces are custom. Optimizing advanced structures and leading-edge optical solutions specific to customer's requirements is our norm. Click the graphic to read the Laser Focus World article about Dream's lightweight mirrors. 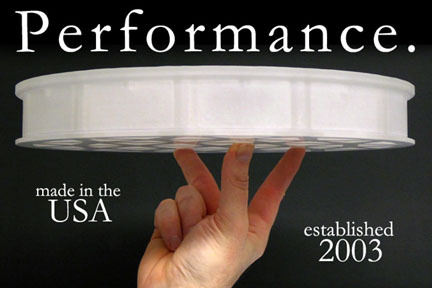 Dream creates world-class lightweight mirrors with solid mirror-level Mid-Spatial Frequency (MSF) errors, validating Dream's engineering, expertise and paradigm-shifting high-performance lightweight mirrors. During the coldest weather in at least 25 years, Dream finishes two more zeroDELTA mirrors in its extremely stable polishing & test room. An athermal, alignment telescope for the world's highest resolution telescope array. A critical fold mirror and dedicated, athermal carbon fiber mirror mount for the world's largest solar telescope. Airborne fast steering mirrors with dedicated, athermal carbon fiber mirror mounts. December 2018: Dream starts work on f1.0 zeroDELTA lightweight mirror for aerospace prime. December 31st, 2018 - Dream successfully casts custom f1.0 zeroDELTA substrate. European manufacturer receives Dream's 250mm CA fully generated & perforated zeroDELTA mirror blank. Later receiving multiple convex secondary mirror blanks and 300mm CA primary mirror blanks as well. Optifab: Rochester, NY. RJ in the Schott booth with two Dream zeroDELTA mirror blanks (left) and Don in 4D Technologies booth with the NanoCam Sq on top of a 400mm Dream zeroDELTA mirror; 9.5 lbs (right). Dream casts and fully processes a bubble-free f1.376 mirror for an Adaptive Optics project. The mirror is six times lower in areal density than Hubble's M1, but is finished with conventional polishing techniques. 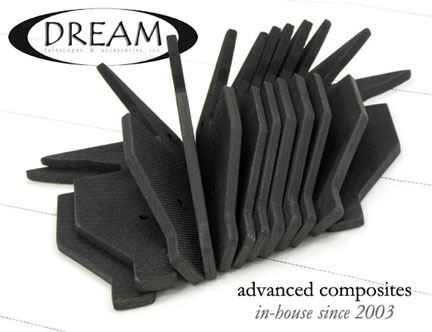 Dream's CF and CFSC performance is unusually high because our engineered advanced composite structures have been created from the ground up specifically for demanding opto-mechanical systems, not open-market composites. - Capability To Design, Engineer & Produce Standard and Custom Full Instruments, Including Athermal Opto-Mechanical Instruments & Corrective Lenses, Low CTE, High Stiffness CF Housings and Spacers For Corrective Lenses. Dream's zeroDELTA lightweight mirrors have both unrivaled engineering and performance because we put just as much engineering in the lightweight mirror as the mirror mount. Dream is also at the cutting edge due to the thin features of the zeroDELTA lightweight mirrors. "Your company does phenomenal work. Dream's engineering sets their lightweight mirrors apart from competitors. Your engineering goes beyond the lightweight aspect. You focus on actual performance!" T h eoof u t u r eooo fooa s t r o n o m yooi sooi nooaood r e a m .
Dream's technologies create enabling & disruptive high performance systems by using truly modern materials, techniques and designs that have fully addressed centuries old mechanical and thermal issues in optical systems. Although Dream offers standard optical systems, the bulk of Dream's work is focused on creating custom solutions for clients. Dream can design, analyze and produce a wide range of optical systems, from numerous forms of Cassegrains to corrected Newtonians to wide field 1m prime focus instrument. Our lead optical engineer has nearly 40 years of both design and implementation experience, especially with fast & demanding optical systems. Finished instruments have the lowest possible maintenance due to Dream's unique technologies. Dream's telescopes are low in total mass, have an extremely low CTE, are corrosion resistant and have a higher stiffness (and strength) to weight ratio than conventional materials. They are designed from the ground up for remote/robotic use. Because of their near zero maintenance they are ideal for border survelience, military, science, education and numerous additional applications. Dream works in the UV, visual, NIR, Mid to Far IR. Used for; lasercom, LIDAR, AO, astmospheric research, surveys, discoveries, airborne, balloon-borne, optical systems used in demanding thermal environments, etc. Customers using Dream's technologies: US Air Force, NASA, Raytheon, Honeywell, numerous government R&D labs, Universities, Professionals, as well as numerous OEM's, for world-wide customers. Dream is currently registered with DOD & DOE customers, as well as sam.gov. Call (610) 360-7874, e-mail info @ dreamscopes . 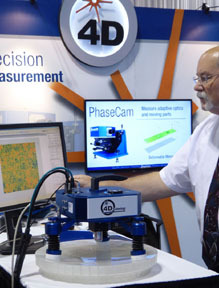 com or schedule a visit to see the advantages Dream offers by using modern materials, designs and optimized methods of fabrication, specifically created for the tight tolerances of modern opto-mechanical & electro-optical systems.